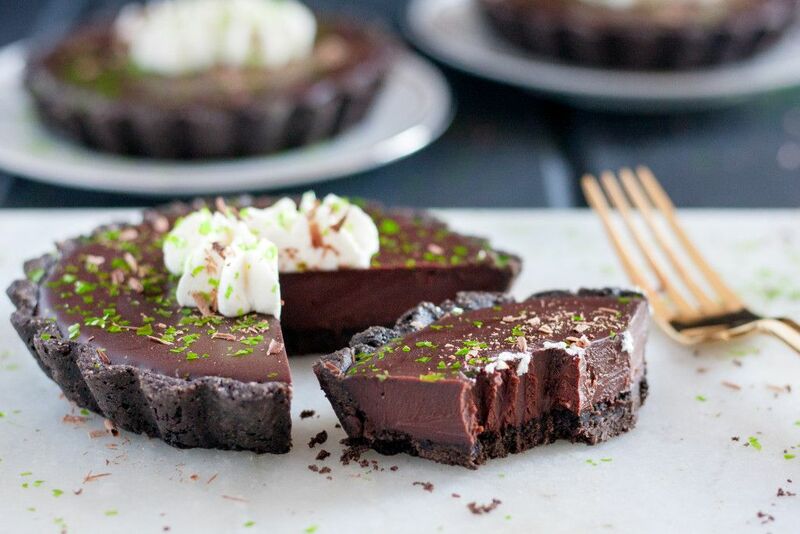 For a more elegant St Patrick’s Day dessert, or just a delicious anytime chocolate indulgence, these Irish Cream Tarts are a creamy, rich treat. 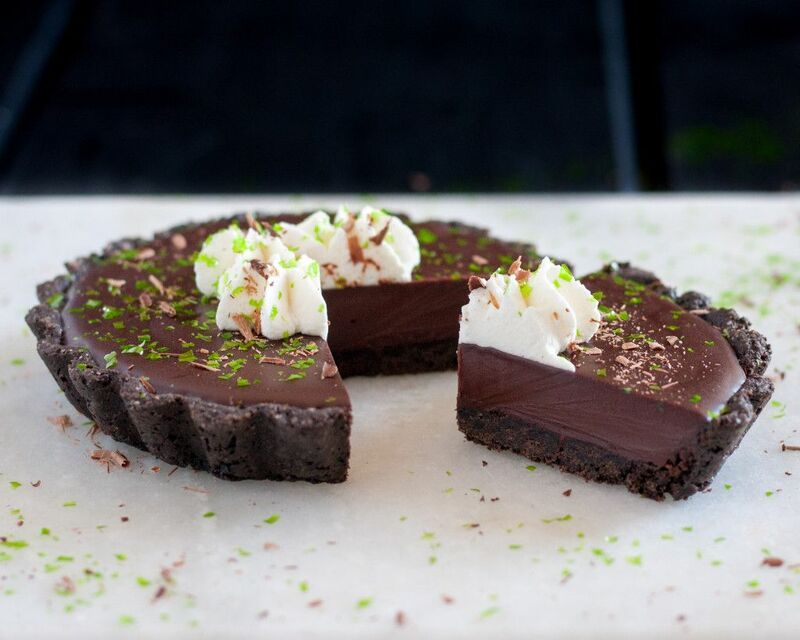 So, what do you make when you want to use tart pans, have a fun St Paddy’s Day dessert on the blog, and you want to bake with crazy amounts of chocolate? Irish cream tarts, of course. 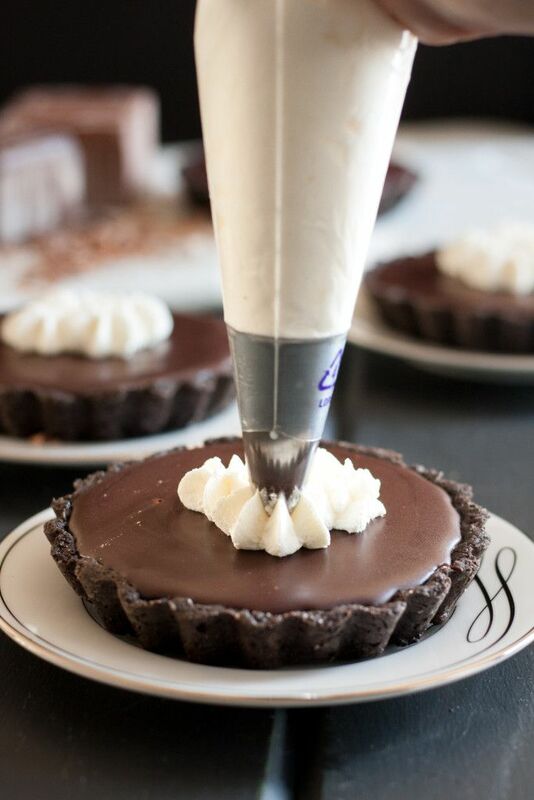 You do have to bake the chocolate crust, but once that’s done, there’s no baking for the filling. 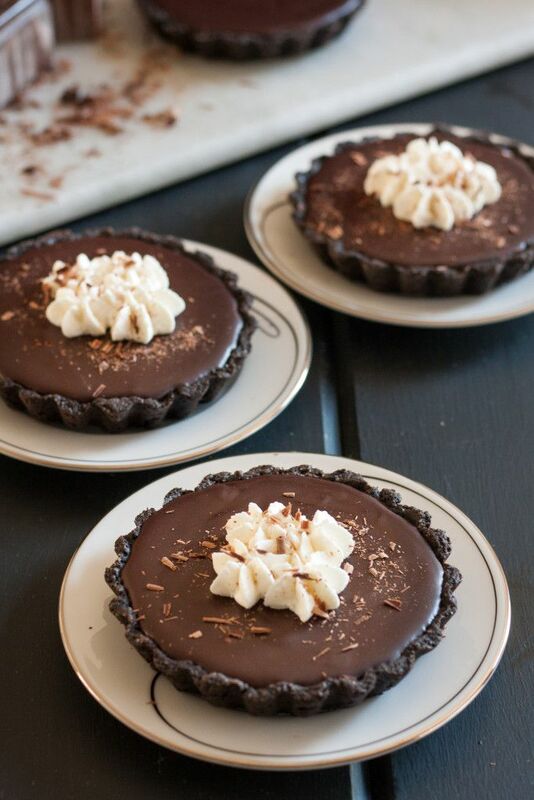 You just pour the Irish cream ganache right into the shells and let it set. If you follow me on Periscope, you may have caught my broadcast when I made this ganache because I just had to share how pretty it looked. You can, of course, also use this same ganache for truffles or frosting, but I really really really liked it in the tarts, so I do recommend giving these a go. On a slight side note, Periscope is new for me, and I think I’m going to use it to broadcast a series called “Cake and Karaoke”. There likely won’t be too much singing from me (you’re welcome), but I’m going to go live when I decorate cakes casually (i.e. 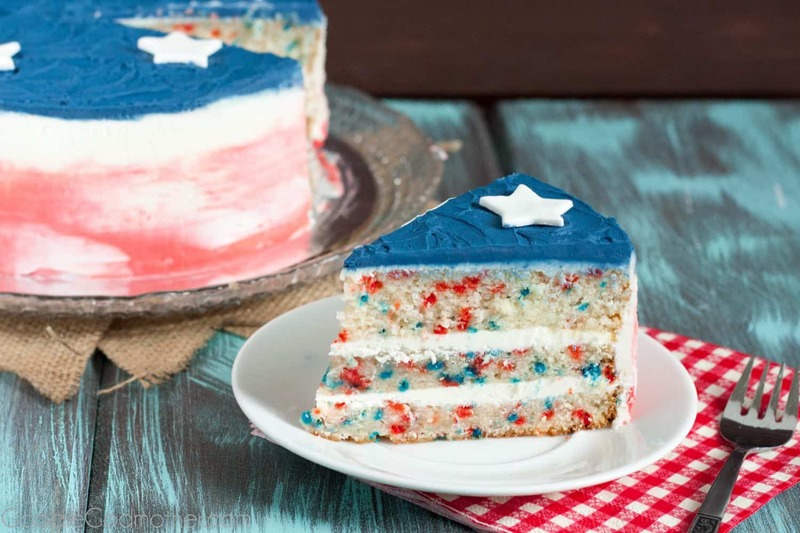 – I’m not filming for an official tutorial video), and I will share pointers as I go about cake decorating and answer any questions that pop up into the live feed. This doesn’t happen on a schedule, but I’ll try to post a notification a few hours in advance on social media somewhere. Back to the tarts. 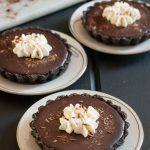 I wanted to make sure they were quite chocolate-y, so I made them with a chocolate tart crust, adapted ever so slightly from Martha Stewart’s recipe. You do have to blind bake the crusts since you aren’t baking the filling at all. 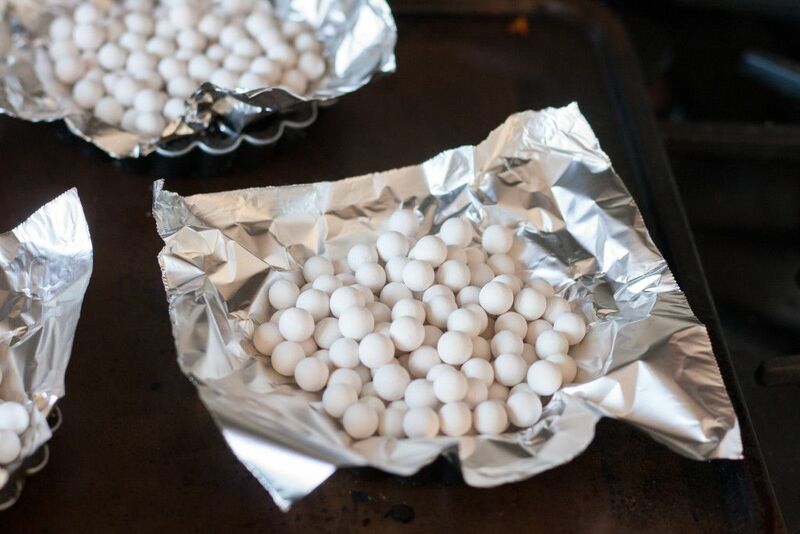 Blind baking basically means that you cover the tart crust with aluminum foil, fill each tartlette pan with dried beans, dry rice, or pie weights, and bake until it’s mostly cooked through, then uncover and bake until completely cooked through. In recipes where you need to bake the tart filling, you may not bake the crust until completely baked through before adding the filling, but since we don’t bake the filling here, we do. I found the chocolate crust to be slightly more difficult to work with than a standard tart crust, and it was most pliable after sitting out 5 minutes before rolling. Be sure to roll your crust thin enough that it bakes quickly and ends up with a nice crispness to offset the creamy ganache. And this ganache is beautifully creamy. The Godfather was raving about how good it turned out. 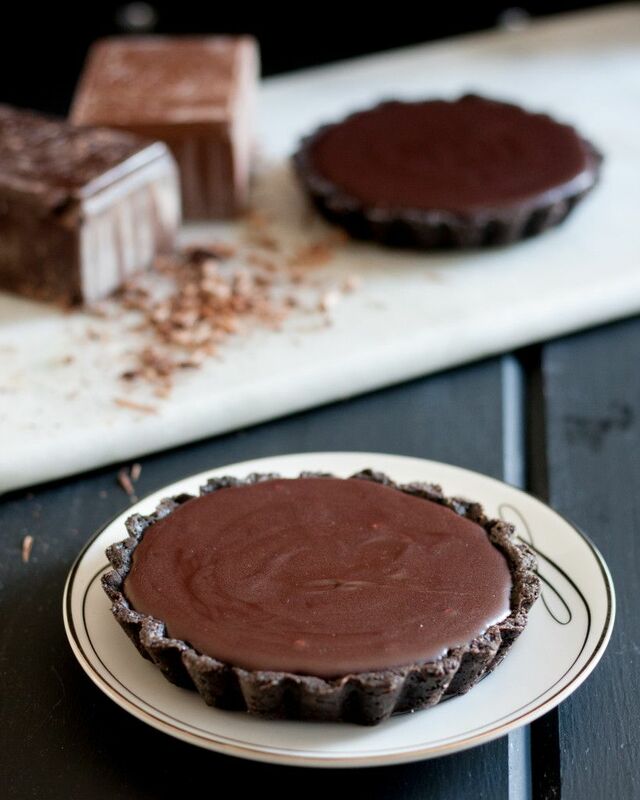 To prevent the tarts from getting too sweet since Irish cream is already quite sweet on its own, I made this using dark chocolate, and it was perfect. The ganache set up beautifully after being spooned into the cooled tart shells, and I was able to assemble in the evening, allow them to set overnight (they don’t require that long though), and top with an Irish whiskey infused whipped cream the next day for pictures and eating. 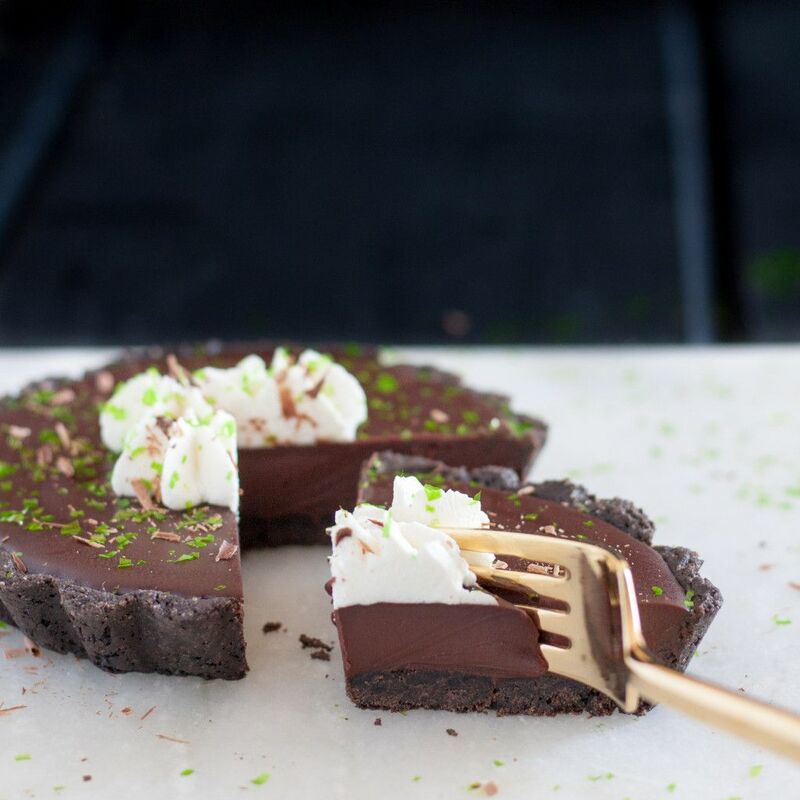 If you’re serving the Irish cream tarts for a dinner party or any time of year that isn’t Saint Patrick’s Day, keep topping simple with just the whipped cream and maybe some shaved chocolate. If you’re looking for something a bit more “festive” though, add a few green sprinkles! I used a green edible glitter. Prepare the chocolate tart dough by pulsing together the flour, cocoa powder, sugar, and salt. Add the butter, egg yolks, and Irish cream. Pulse until the dough just comes together. Add heavy cream, 1 tbsp at a time, if needed. Shape the dough into a disc, wrap in plastic wrap and refrigerate at least 30 minutes, up to two days. When you are ready to bake your tarts, preheat your oven to 400 F.
Remove your tart dough from the refrigerator and divide into 4 equal portions. Roll out a section, then without pulling the dough, place into a tart pan, making sure to press into the corners. 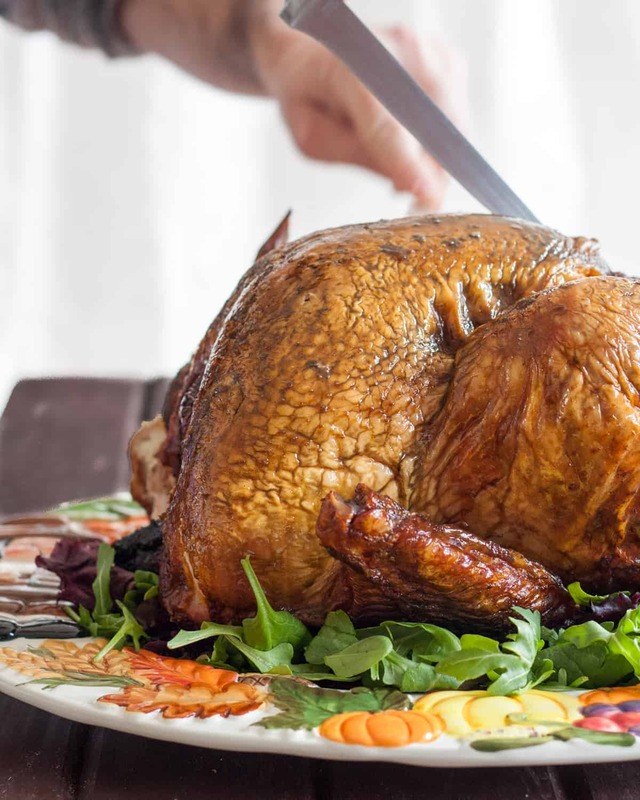 Use a sharp knife to trim any overhang. Poke the crust with a fork in a few spots, then cover with aluminum foil and fill the tart pan with dried beans or pie weights. Repeat for the remaining tartlette pans. Bake the tarts for 10 minutes with the weights, then remove from the oven, remove the weights and foil, and bake an additional 5 minutes without the weights. Set on a wire rack to cool. While the crusts are cooling, make your ganache by melting together the chocolate, butter and heavy cream in the microwave (start with 1 minute 50% power, stir, add 30 second increments as needed), or use a double boiler. Once the chocolate has melted and the mixture is smooth and shiny, stir in the Irish cream. 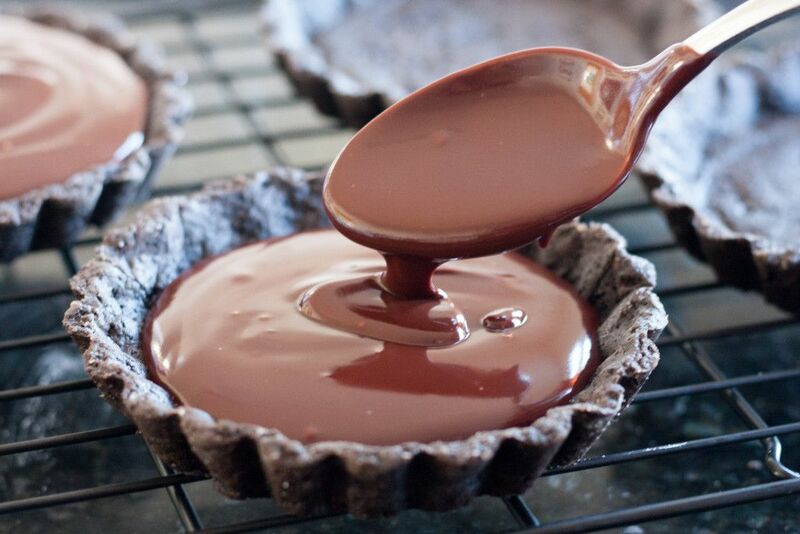 Set the ganache aside for 10-15 minutes until the tart shells are cool. Spoon the ganache into the shells, shaking gently if needed to smooth the tops and help the ganache settle. In a mixing bowl or the bowl of a stand mixer, place 1 cup chilled heavy whipping cream. Start whipping using a hand mixer or the whisk attachment on your stand mixer. Add the sugar once the mixture starts to become frothy. Keep whipping until soft peaks form, then fold in the Irish whiskey. Pipe onto the tarts and top with chocolate shavings and/or sprinkles if desired. 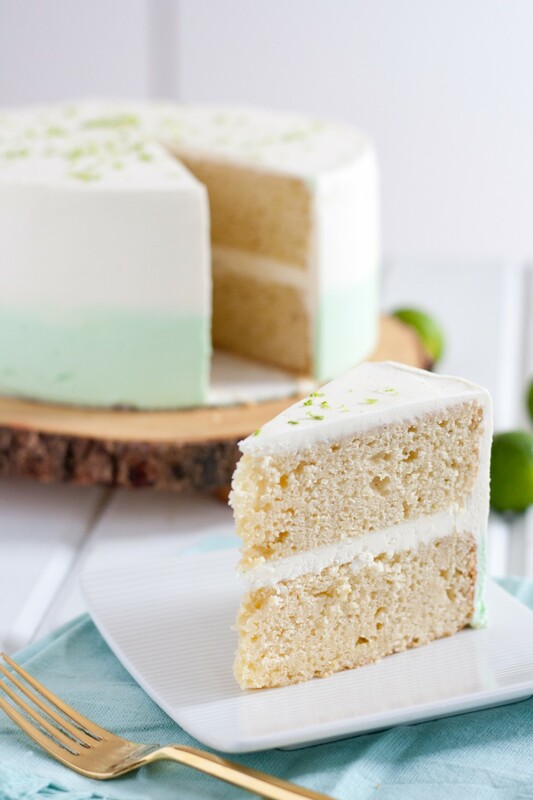 Good grief Mary these just look incredible 🙂 I am also not much for celebrating St. Patty’s day….but having these for dessert would tototally be a reason to celebrate! These look amazing! I know my hubby would love them…and I have a feeling I would have to make extra Whiskey whipped cream! Squeeeeeeeeeeeeeeeeee! I want ALL THE TARTS! Gimmie! Seriously, though. These look amazing. Oh gosh. What have you done?!? Meaghan | Cook. Craft. Love. My mouth is watering. I must have these babies. I love Irish Cream and it sounds great with dark chocolate. Do you think this could be made in a full size tart pan? Absolutely! I’d add about 2 minutes to both the blind baking and final baking times, but otherwise, everything is the same!